There has perhaps never been a more vital time in American history that newspapers and the reporting found within have been needed. Without them, democratic institutions crumble, and those who would abuse power can run amok. 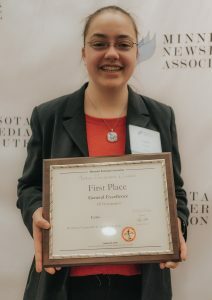 Because of its efforts to adhere to the foundations of journalism and reporting, the Rochester Community and Technical College Echo beat out newspapers from four-year colleges to take home the award for general excellence for best college newspaper at the Minnesota Newspaper Association’s Better Newspaper Contest. Angelina Labonne and Lydia Hansen took home awards. 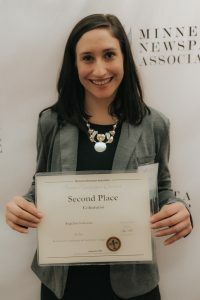 The most recent former Editor in Chief Hansen placed in three categories: second for business writing, third for a sports feature, and third in column writing. Labonne, another former Editor in Chief, earned second for her column on grieving the loss of her mother. The Echo has actually placed three times in the general excellence category, placing third in 2017 and second in 2018 before taking top spot this year.